Boat docks sit on what used to be the bottom of Lake Mead at the abandoned Echo Bay Marina in Overton, Nevada. Arizona will be hardest hit if 17 years of drought keep drying up a reservoir serving much of the Southwest, but the state’s lawmakers and governor don’t agree on how to keep water in the lake or who should be in charge. 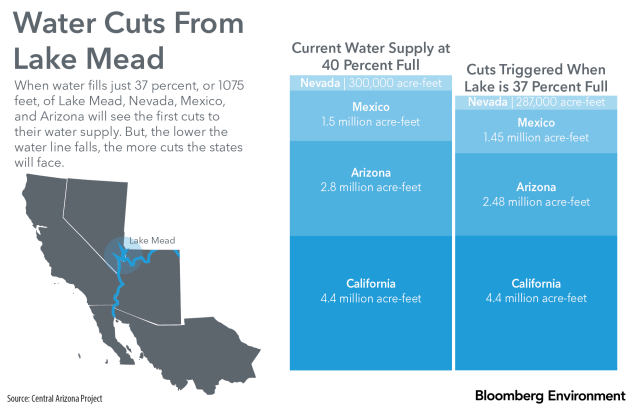 Lake Mead, a man-made reservoir fed by the Colorado River, is an essential water supply for several western states that will take a hit if lake levels dip much lower. That could create chaos in places that depend on the river to sustain communities and fuel economic growth. Arizona uses less water now than it did in the 1950s, even with a five-fold population increase, according to the governor’s office. But the state will take the biggest losses if restrictions approved by the U.S. Department of the Interior take effect, a possibility it has long planned for. A shortage on the river would pinch the state’s farmers and builders, and, eventually, residents in its cities. Arizona is working on a conservation plan to stave off that crisis before it enters a regional deal with Nevada and California to stabilize water levels in the lake. But Arizona’s delays could threaten the tri-state pact. Gov. Doug Ducey (R) has pushed Arizona to speak with “one voice” on policy changes this year, but his proposal to shift power among water agencies in the state has met resistance from lawmakers and water users. It’s unclear if the sides can agree before the end of the legislative session this spring. Colorado River conservation is a fraught proposition and any changes must navigate a complex network of politics, management agencies, competing priorities, and legal settlements. Ducey’s office recently released groundwater and Colorado River water conservation proposals he said would build on Arizona’s success managing a scarce resource. Arizona’s inability to complete a conservation plan won’t just harm the state’s residents, but it could also jeopardize efforts to draft a drought agreement with California and Nevada, Patricia Mulroy, senior fellow for climate adaptation and environmental policy at the University of Nevada, Las Vegas’ Boyd School of Law, told Bloomberg Environment. As part of the deal, California would take reductions in its water allocation from Lake Mead before being required to do so, Mulroy said. Neither California nor Nevada need legislative approval before signing on to the conservation plan, but in Arizona, where lawmakers must take action, the ongoing divisions could scuttle the deal. The states are trying to keep Lake Mead above 1,075 feet of water. Falling below that level will create shortages on the Colorado River and will trigger reductions in water allocations. 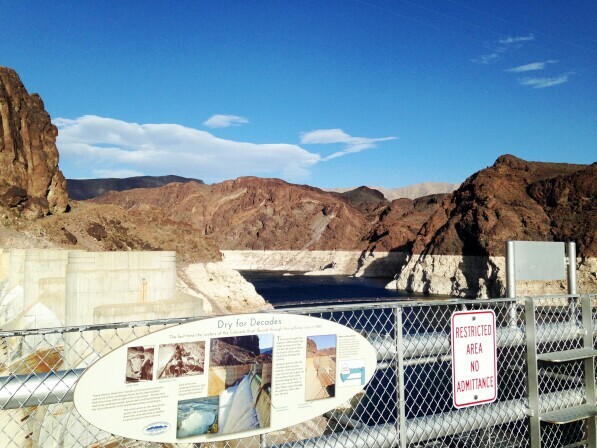 The region pulls more water out of Lake Mead each year than flows into it, and the prospect of mandatory water restrictions is increasingly likely without a deal, Mulroy said. Colorado River water is overallocated to its users by the Bureau of Reclamation, and Arizona has the lowest priority supply in the case of a shortage. State officials fear that could hurt how companies perceive Arizona, a concern echoed by groups like Business for Water Stewardship. Central Arizona farmers would see their water use cut before residents in cities like Phoenix and Tucson. “We don’t need to create a crisis and fear in people, but we need to act,” Hunter Moore, Ducey’s natural resources policy adviser, said during a recent briefing with city and state officials organized by the Institute for Journalism and Natural Resources reporting fellowship. Reaching that multi-state deal “involves a very careful choreography to make sure this works and all are in agreement,” Jeffrey Kightlinger, general manager for the Metropolitan Water District for Southern California, told Bloomberg Environment. California hasn’t completed its work on the plan yet because Arizona is signaling that it is in no rush. “If one state sits out, we can’t do it. It is unfortunate because the drought is getting worse, not better on the Colorado River,” Kightlinger said. Ducey’s plan, backed by the Arizona Department of Water Resources, pushes voluntary conservation of Colorado River water in Lake Mead to keep the levels up. Users would enter into state-brokered compensation agreements to leave some of their water there. It would also change the power balance between the state water department and the Central Arizona Water Conservation District. The district manages and operates the Central Arizona Project, 336 miles of canals and pipelines that transport Colorado River water to cities, tribes, and irrigation districts. The state department would get new authority to manage some of the Lake Mead savings. The conservation district would see its power limited, including needing approval to negotiate interstate Colorado River water transfer deals. Ducey’s conservation plan reflects the concerns of all counties, not just the few that the water district represents, Thomas Buschatzke, director of the Arizona Department of Water Resources, told reporters. But representatives of the Central Arizona Water Conservation District say their existing conservation measures have kept the lake above shortage levels. The district also wants to balance saving water with delivering it to communities that need it. Rep. Kirsten Engel (D), whose background is in environmental law, said she’s concerned about consolidating power over water. She said Arizona is looking at a water crisis, but that there isn’t enough consensus in the Legislature to make major changes. “I don’t see the governor’s proposal as the right response to that crisis,” Engel said. Lawmakers have yet to introduce measures to move Ducey’s priorities forward, and it’s unclear what water legislation could make it to his desk. Major bills have been debated primarily in terms of what they don’t do: address shortages on the Colorado River. A large bathtub ring shows where water used to sit in Lake Mead, a lake on the Colorado River about 24 miles outside of Las Vegas on Feb. 22, 2018. The lake, which is the largest reservoir in the U.S., feeds Arizona, Nevada, California, and Mexico, was measured at 40 percent full in August 2017. It’s unlikely water bill sponsors will push conservation measures this year. Rep. Rusty Bowers (R), who is sponsoring an omnibus water bill, said he’s looking for consensus on other changes, like researching desalination. The bill isn’t without controversy. Some fear other changes the measure would make—such as allowing some rural counties to reconsider rules that require proof of a 100-year water supply to support new development—would weaken the state’s groundwater protections. Ducey vetoed similar bills in 2016. Ducey’s office has approached bill sponsors with its conservation priorities to negotiate changes. But Bowers said a plan needs more input from water users across the state. In central Arizona, for example, irrigation districts rely on excess water from the Central Arizona Project’s supply. Farmers are sensitive to changes in how they negotiate with that agency and know they have the most to lose if Lake Mead reaches shortage levels. But Ducey’s plan is backed by some irrigation districts and farmers in Yuma County, the world’s winter lettuce capital at the Arizona-Mexico border. Those water users have their own contracts for Colorado River water and see some overreach by the Central Arizona Water Conservation District, Wade Noble, coordinator of the Yuma County Agriculture Water Coalition, told Bloomberg Environment. “Our major issue is who speaks for Arizona on Colorado River issues,” he said. Lawmakers just started a series of water meetings throughout the state to collect feedback. A recent event in central Arizona drew farmers, environmental groups, and think tanks with concerns ranging from groundwater supplies to the urgency of drought mitigation. “There are people here who don’t normally talk to each other,” Bowers told Bloomberg Environment. The disagreements have led some to hope Arizona’s legislative session ends without any changes to water policy. The Sierra Club’s Grand Canyon Chapter opposes major bills on the table and wants a more open water planning process, Chapter Director Sandy Bahr told Bloomberg Environment. “I’m guessing the best thing we can hope for is to do no harm,” Bahr said. The Sierra Club has received funding from Bloomberg Philanthropies, the charitable organization founded by Michael Bloomberg, the ultimate owner of Bloomberg Environment. But others say time is running out. The Colorado River is a major economic driver in Arizona, and businesses need a secure water supply. There is the possibility of a shortage on the horizon, said Nicole Gonzalez Patterson, Arizona policy director for Business for Water Stewardship. The group hasn’t taken a position on specific proposals but agrees with the governor that Arizona should reach a consensus, Gonzalez Patterson told Bloomberg Environment. The state can do more to ensure its Colorado River supplies, she said. “Now is really the time to be doing that,” she added.